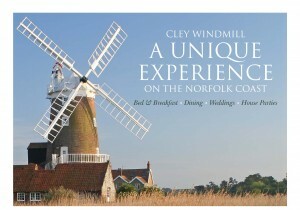 Why not book the entire windmill? 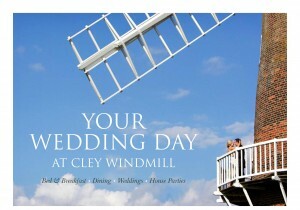 We now offer the opportunity to hire the entire windmill for exclusive days or weeks at a time. This is a unique and memorable way to entertain your friends and family. The windmill can sleep up to 20 in 9 rooms on a B&B basis. Evening meals and lunches are also available. 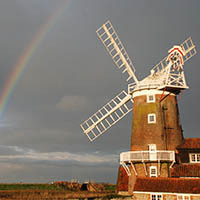 Cley Windmill is renowned for its stunning location within the marshes of the North Norfolk Coast. 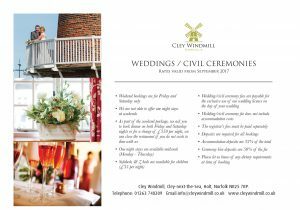 We offer an intimate space for your group event or party, where your friends and family can celebrate together, whether it be a special birthday, a Golden Wedding Anniversary or a reunion. 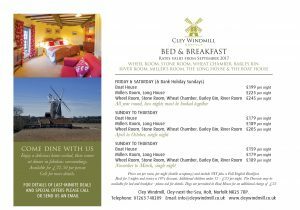 If you would like to take over the windmill you can either book all our B&B rooms (which accommodate 16) or include our self catering cottage (Dovecote) and take your numbers to 18 or 20. Please contact the windmill for more details. Weekend bookings are for Friday and Saturday only. We are unable to do one night bookings over the weekend. During the winter season, the cost of accommodation is reduced for a Sunday – Thursday booking, but only for a two night stay. At the time of confirming a booking, a deposit of 33% of the accommodation costs is required. Option 1: book a buffet / supper / formal dinner for all nights. 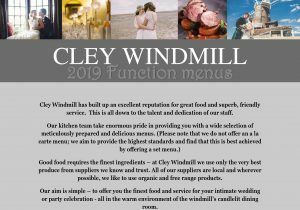 Option 2: you do not want to dine at the windmill you will then be asked to pay an exclusivity charge of £300.00 per night. Please ask to see our menus. The windmill has a full licence. Please ask to see our comprehensive wine list. Sorry we do not offer corkage.